We love this time of year! For us, it’s a time to reflect and celebrate. We think about the whirlwind of the year and stop to focus on those positive things….like you. Our clients make it all worthwhile. We enjoy working with you and helping you to get into your new homes. It is inherently a stressful time for anyone because of all the details and unpredictability, but we try to make it as easy as we can. We appreciate your loyalty, support, and referrals. And a huge thank you to our “partners” – Realtors, Mortgage Lenders, Mortgage Brokers, Appraisers, etc. who work with us to make it happen. We couldn’t do it without you! Enjoy this week with family and friends. Let it be a time to pause and express gratitude to all the people you appreciate. 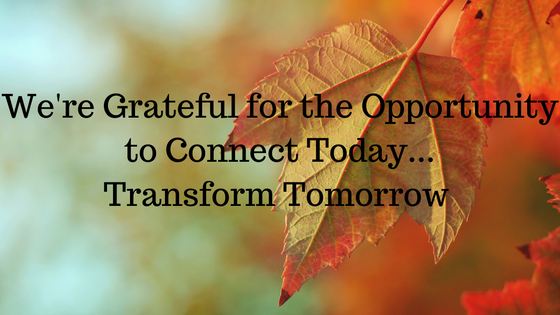 With support and encouragement from each other in life, we can indeed work together to transform tomorrow! This entry was posted on Tuesday, November 22nd, 2016 at 10:20 am and is filed under Blog. You can follow any responses to this entry through the RSS 2.0 feed. Both comments and pings are currently closed.